The symptoms of this bug have re-emerged in 12.10 (Bug 805303) and in 13.04 (Bug 1084255). xwininfo: Window id: 0x1e0004b "Open Media"
xwininfo: Window id: 0x2400012 "calibre - || Calibre Library ||"
Otherwise drains all the memeory, fill the cache, ect. xwininfo: Window id: 0x3200004 "Ubuntu One"
Note that the latest upstream calibre (0.8) works fine as it provides it's own qt4 libs"
Fascinating - it works with the command but not without. I noticed that it was behaving just like my HP fax software (bug 1014701), so I ran LIBOVERLAY_SCROLLBAR=0 hp-sendfax and it launched without problem. I have this problem with hp-toolbox (tested with HPLIP 3.12.6 in Quantal). HP-toolbox does not allow resizing the window or moving the separator between the left and the right part of the window. In addition, it grabs all system memory until I kill it. I believe this has something to do with python2.7. It's a common file between calibre and hplip and seems to break several things. See the attached screenshot from synaptic/python2.7/dependencies. This bug affects Retext (as reported in bug #1026025) as well. Using "LIBOVERLAY_SCROLLBAR=0 retext" helps fix the issue. I think this very problem is also the one reported in bug 1003568. How come this is still not fixed when it appeared in 11.10? @Alain-Olivier: It was fixed in 11.10, but has appeared again in 12.10. For me it crashes calibre on quantal. This happens reliably for me every time I use qbzr (version 0.22.2-1) on quantal. Moved yesterday from 11.10 to 12.10 Beta (clean install), and experienced this bug too. I can confirm that this affects the hplip toolbox, but also Spyder (which is a python IDE). So I'm happy for now. Thank you all for all the comments here, this is invaluable when one runs into issues like these! Note that in yesterdays Calibre update in Quantal, the problem is still evident and LIBOVERLAY_SCROLLBAR=0 calibre is required for crash not to occur. I'm seeing this on my system as well, but the LIBOVERLAY_SCROLLBAR=0 workaround does NOT fix the problem here. I also tried removing the 'overlay-scrollbar' packages. Vlc, spyder, etc are still crashing. Oh ok, I didn't notice that some applications like vlc and spyder stored the invalid window sizes in their config files (.config/vlc, .spyder/). Deleting those and the overlay-scrollbar packages fixes the problem. The problem is that the old way that Qt had to tell Gtk not to use the overlay scrollbars (ubuntu_gtk_set_use_overlay_scrollbar) is now basically a noop since the new overlay-scrollbar hijacks the scrollbars at a different level (does not use os_scrollbar_new as it used to use). It works for most Qt based programs because the new overlay-scrollbar code includes a check to not load itself if the qt_startup_hook symbol is present in the main binary of the problem, thus the issue only happens in programs like "vlc" or "bzr qlog" where Qt is loaded in a plugin of the main binary. Fixes the crashes for me, but it still means that the overlay-scrollbar code is being used (even the scrollbars look normal). Andrea that is the one that did the code is back from holidays tomorrow, I'll try to have a talk with him on how to fix it in a way that's best for everyone. Doug i'd say this is a different beast altogether since all the apps people have been reporting in this bug are using Qt as the toolkit to draw their windows and as far as i know Thunderbird is not, I think it'd be safer if you open a different bug to track that one. Guess it may be better to actually wait till something is released?? As seen in bug 1003551 , this also affects Picard and still does. 'LIBOVERLAY_SCROLLBAR=0 calibre' works, when trying to open calibre other way, system freezes. Cheers. We've had this removed from -proposed now. Can I ask the specific version that's bad? packages just showed up on my mirror. I don't know if those were the broken ones Doug mentioned. (In case the removal hasn't propagated yet.) Or if they're a fix. Thanks. Well, those "0.2.16+r356-0ubuntu1" packages are gone from the updates offered me now, so I guess that answer my question. Now execute any video with VLC. The subtitles should work now. The video rendering should be fine again. NOTE: If you only do LIBOVERLAY_SCROLLBAR=0 it might not work, that is why I mention deleting the config files. VLC was never a problem for me, but hplip was until today. Now if only Thunderbird and Firefox were working properly I would be a happy guy. Great - all works fine here now, this bug, TB, ccsm, ect. I'm still having a Thunderbird problem on my 32 but not 64 bit version of Quantal. It's behaving as if I don't have permission to download mail unless I open it with sudo in a terminal. After the latest upgrade of overlay-scrollbar, I am pleased to report that Picard now finally launches properly in Quantal. With latest updates now HP Toolbox ( Related Bug #1014701 ) works withouth graphical chrashes. 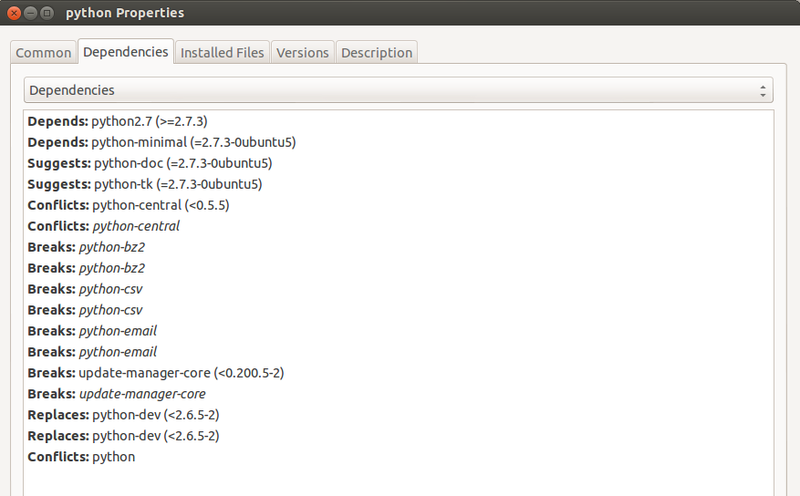 Tested on fully updated Ubuntu 12.10 32bit. Ignore my Thunderbird comment. My mail profile is corrupted in some way. Fixed also for Spyder (on up-to-date 12.10, 64 bit), thanks a lot! Still bugged for 12.10 with calibre after overlay-scrollbar update. This just came back in Raring. Could someone with permission please re-open? File a new bug report. Thanks. affecting calibre atm, vlc seems fine. old debian/rules then there is no issue with calibre.. I probably won't get to making a well-done new bug report right away -- if or when someone does file one, post the number here if you don't mind. Thanks! Well, I found one new report had already been filed: bug 1084255.